I spent winters from age 7 to age 26 huddled up next to heaters in the Midwest, flipping through back summer issues of Seventeen & Vogue that I had saved for long winter months. As a brutal winter veteran, California's mild January days were one of the major reasons I chose to move out to the Left Coast. Perennial sweater weather called my name - and when I'd finally had enough freezing temps, I donated my puffer jackets and Sorels and heeded the call. 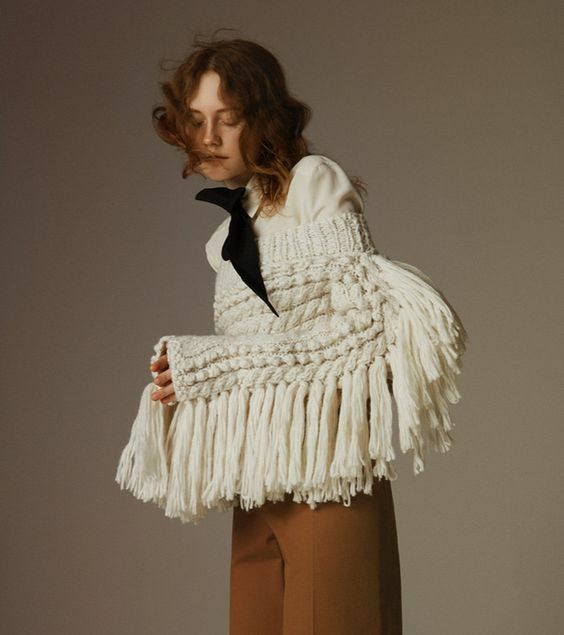 This winter's trend of enormous, oversized, beautiful sweaters has been so fun to participate in without needing to wear a Michelin Man puffer jacket over everything!! And hey, even if you still have to do the floor length LLBean coat thing, a huge statement sweater makes for a grand reveal when the coat comes off! 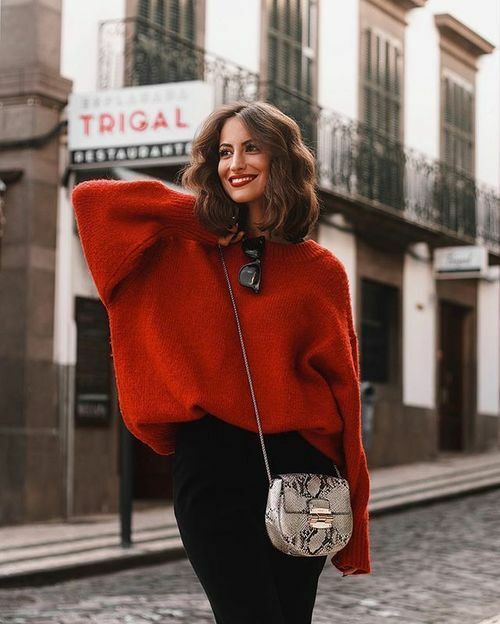 Here are some ingenious outfits featuring oversized sweaters, all sourced from Pinterest. There's nothing more lovely than a huge comfortable knit that reveals a little more than expected. I love sweaters with tie closures and slouchy details - cut outs can be either gorgeous or completely tacky, so tread lightly there. If you're not sure if you should rock a particular cut out look, follow my rule of thumb: if it looks like Captain Jack Sparrow nicked you in a sword fight, just say no. 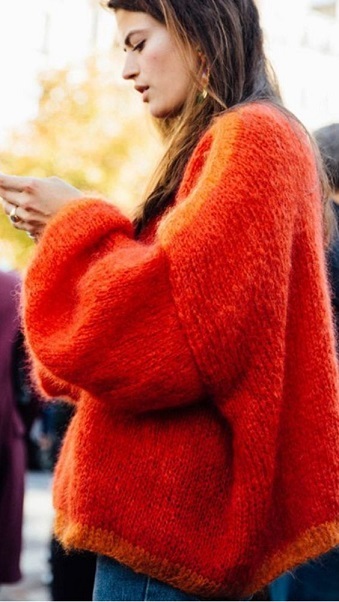 While a basic oversized crew is a no-brainer, there's something intriguing about distorting proportion & texture on an already oversized sweater. There's more fabric to be played with, and a bigger statement to be made. I've long been a fan of furry sweaters, but this year I'm fascinated by either very thin or super thick knits as well. The yellow mohair-looking sweater in this slideshow is #GOALS. Though I've been way less into pattern the past year, huge sweaters are a perfect place to throw on a little extra spice. A giant knit with statement stripes or a modern art doodle is "Go big or go home" to the max and I love how assertive the combination is. Maybe not a feasible option for most of the folks back east, but let's call it the West Coast Coat. I can't get enough of robe-like outerlayers. They give the impression that the wearer is as cozy out in the world as they were when they woke up this morning, just turned up a few sartorial notches. Inner-wear as outerwear. I lurve it. What is it with me and red right now?!?! I spied dozens of all-red get ups in Paris, all my red lipsticks seems to be making a comeback, and my eye is immediately drawn to it wherever I encounter it. My favorite pair of red pumps got destroyed on my birthday in Paris and I've been actively missing them - I keep thinking that every outfit I throw on would be exponentially better if it had a kick of rouge. Sooooo of course I'm obsessed with all these sweaters. Get out your hugest sweaters and have at it!